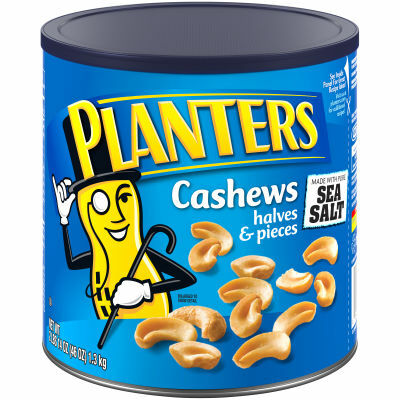 Planters uses only the highest quality cashews in its Planters Cashew Halves and Pieces mix, which features the nut lightly dusted with sea salt for an enhanced flavor in every bite. These halves and various sized pieces of cashews are ready to be used in your favorite recipes without the hassle of crushing them first. Toss them onto a garden salad or take a handful as an afternoon snack. No matter how you use them, these cashew halves and pieces are free of trans fats and cholesterol, making them a light and wholesome addition to your daily menu. Serving size 1oz (28g/ about 43 pieces).